Office hours: Monday to Friday 10.30 - 13.30. You can also leave a message at any other time. 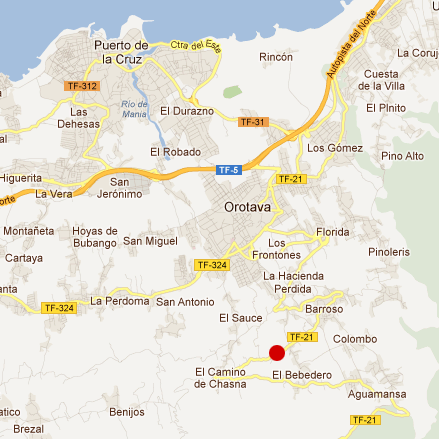 BY BUS: Catch bus number 345 from La Orotava or Puerto de la Cruz to the bus stop at Cañeño. Walk downhill for 200 metres. We are on the right-hand side of the road. Approximately 1 bus (345) leaves every hour from Puerto de la Cruz and/or La Orotava bus station. On weekdays, the last bus from Puerto de la Cruz leaves at 20.40. The last bus from Orotava leaves at 21.55. On weekends the last bus from Puerto is at 20.15, and the last bus from La Orotava is at 20.30. BY CAR: From the TF5 take exit 33 in the direction of La Orotava/El Teide. Pass through La Orotava and the village of Barroso (TF21) and continue until kilometre stone 10. After 200 metres you will see Casa Saraswati on the left. `Teatro del Corazón Associación´ is a non-profit organisation. In accordance with the provisions of Organic Law 15/99 On Personal Data Protection, we inform you that your personal data will be included in our files. We will only request information that is relevant and necessary for the purposes of booking a course, a retreat or a stay at Casa Saraswati. When registering your details with us, please tick the box indicating that you are giving your consent to `Teatro del Corazón´ to store this information for the above purposes. We will store your information on an on-going basis so as to inform you of our events or facilitate any future course bookings or stays. the right of access, rectification, cancellation and opposition.